The slot is based on the Greek Mythologie and is played on a large 5×5 grid. In a beautiful design, this game has the advantage of consecutive winnings. 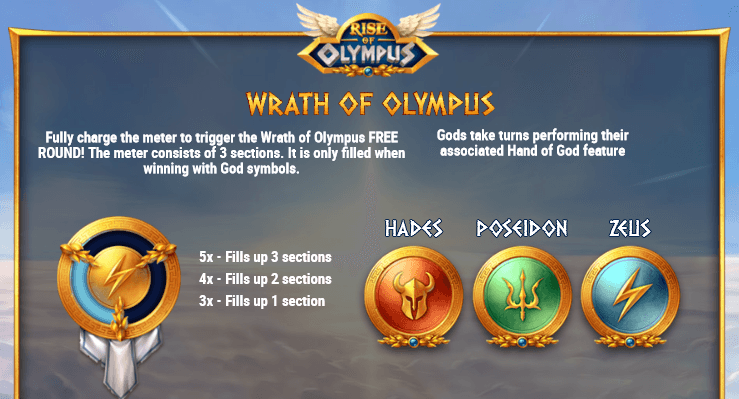 Rise of Olympus has a Hand of God feature in which different deities either transform symbols, add wild symbols, or destroy symbols. 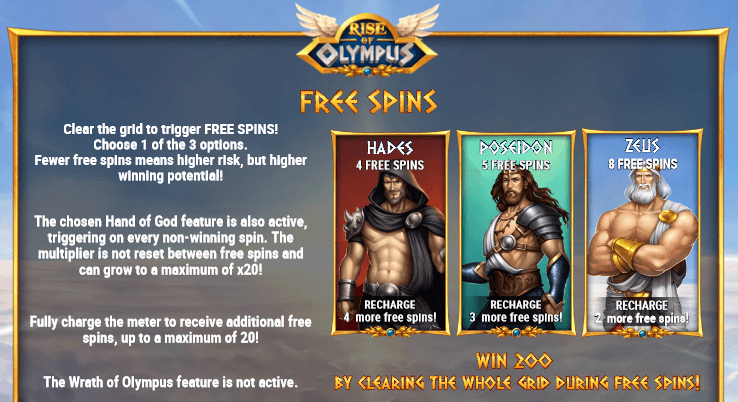 In the Wrath of Olympus feature you have to fill up the meter to get up to 20 free spins with multipliers. In Rise of Olympus you meet the ancient gods who let their powers play. Hades, Poseidon, and Zeus are the three big ones who of course are also part of the symbols. In addition there are objects of the gods, such as a helmet, a trident, and a lightning. Depending on which of the gods stands next to the rollers, the background changes. Hades in the Underworld has a fiery red background that looks grim and dangerous, whereas Poseidon is underwater and therefore surrounded by harmonious greenery. Each of the gods wears combat clothing and is armed. The Wild Symbol is the most lucrative one here and pays a 50x win on your bet when 5 of them come together on a payline. When a winning combination is earned these symbols disappear and in their place new symbols fall down from above. As a result, another winning combination can be formed and thus bring you consecutive profits. You also receive a wild symbol for every win placed in the middle. With each additional win, the multiplier increases. If there are only wild symbols on the reels you automatically get into the free spins feature. As we mentioned earlier there’s the Wrath of Olympus feature, which is used when you’ve filled the meter. You can take the meter through winning combinations involving gods symbols. If you get 5 equal symbols, fill in 3 sections on the meter, 4 equal fill 2 sections and 3 equal ones corresponding to 1 section. Once the meter is full you will receive a free game. Immediately afterwards, the Hand of God feature activates, transforming symbols, adding wild symbols and destroying a set of symbols. If you manage to clean the entire grid of symbols, activate the Free Spins feature. 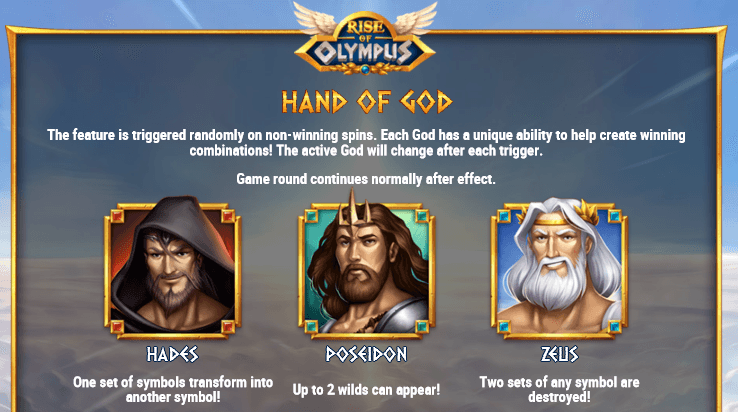 The accompanying Hand of God feature will be used according to your selection, because if you choose Poseidon, for example, then 1 or 2 wilds will be added to the grid every time you make a lossy spin. Each successive win raises the multiplier up to 20x! 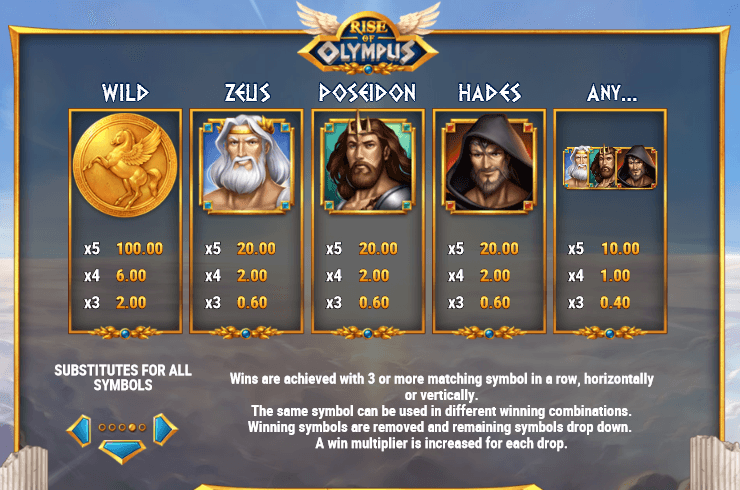 If you manage to fill the meter during the feature, you will get further free spins (Hades = 4, Poseidon = 3, Zeus = 2). You can do this multiple times, up to a maximum of 20 free spins. If you manage to clean entire rasters during a free spin, you will receive an instant 100x multiplier on your bet. 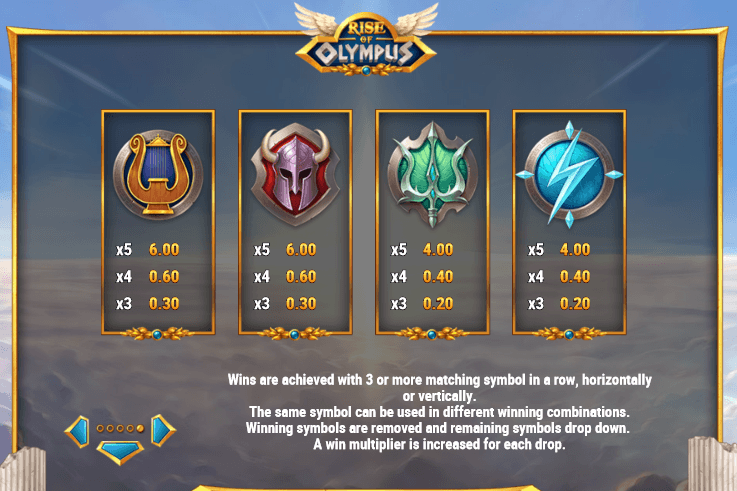 The Rise of Olympus Slot sounds more complicated than it actually is. The Hand of God feature is randomly activated on lossy spins and brings you wilds, transfers and removes symbols for further potential winnings. The main attraction here is the Free Spins feature, with each lossy free spins feature activating the Hand of God feature and a multiplier of up to 20x.